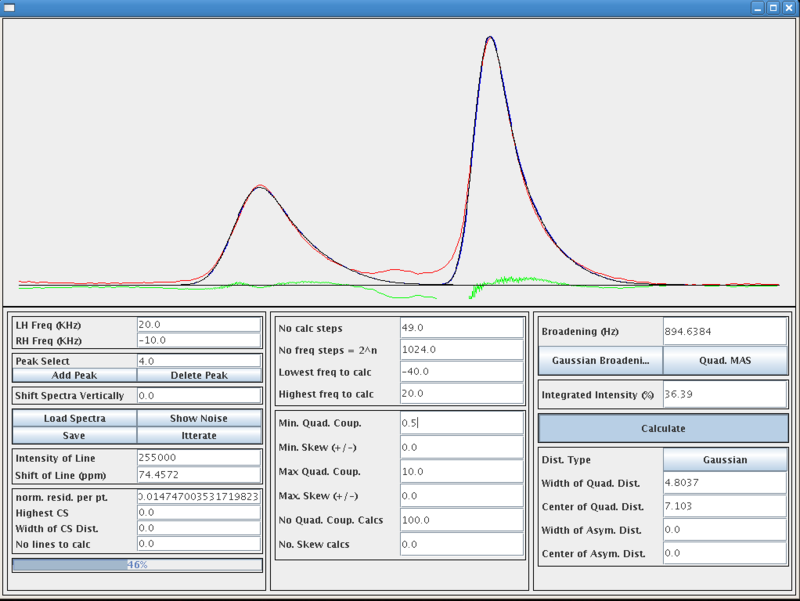 QuadFit is a platform independent program for simulating distributions of CSA and Quadrupolar interactions, written and maintained by Dr Thomas Kemp. 01 May 2007 — Solved some issues with total line calculations, rounding of input number along with formatting. 20 July 2007 — Added the Larmor frequency, nuclear spin and current file open to the title of the windows. 06 Nov 2007 — Ability to read in Bruker files when saved as text files (real data only). 15 Nov 2007 — Ability to change the resolution which the program runs at in the initial screen. 12 Dec 2007 — If I=0.5 is entered as the program is designed to work with quadrupolar nuclei, it changes I=1.5 so the program works and sets the line type to CSA. 19 Dec 2007 — Ability to use Lorentzian broadening and a combination of Lorentzian and Gaussian broadening. 10 Jan 2008 — Some minor corrections. 28 Mar 2008 — Changed the way graphs are displayed, corrected a slight problem with the intensity of the line, removed ability to distribute Span and Skew. 21 Nov 2008 — Removed artifacts created during broadening, allowing for a reduction in the width used for calculations resulting in faster calculated better quality line shapes. 17 Dec 2008 — Minor corrections. 24 Mar 2009 — Modification to how the program reads in data due to variations in the ordering of Bruker data. 22 Feb 2010 — Allow sigma in Czjzek distribution to vary above 1. Include build data in title of first window. 06 Jan 2012 — Fix for rounding error when using non-English versions of Windows, change from Alderman-Grant Interpolation to modified Sphere stepping for calculations. Currently due to other commitments the development of the program is very slow. Despite this if you have any bug reports or comments please e-mail me at t dot f dot kemp at warwick dot ac dot uk.